Six people were killed in a crash on Sydney Harbour last month. 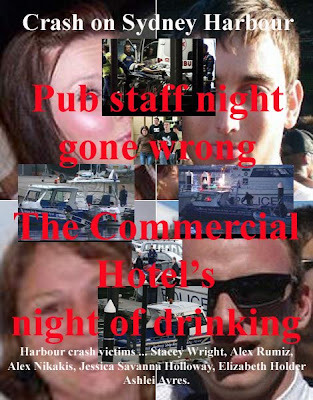 Balmain bar staff described the incident as a pub staff night gone wrong.. Ports and Waterways Minister Joe Tripodi says the reforms include new penalties for dangerous behaviour and a compulsory practical component for aspiring boat skippers. Mr Tripodi says the number of nights patrolled has increased from 6 per cent to 15 per cent in the past six months. He says there are plans to increase that further. "In times of heightened risk, for example New Year's Eve, there'll be more maritime officers out there patrolling the waterways," he said. "It'll be a risk-based approach but what we have done already is increased the night patrols by 150 per cent." NSW Maritime acting chief executive Steve Dunn says patrol plans are dictated by the time of year and weather conditions. Mr Dunn says patrols cannot possibly cover the entire harbour, so extra services will not necessarily reduce the risk of fatal boat accidents. "We would love to have patrols out there more often but obviously, we react to the perceived need of the risk that's facing us at a particular time," he said. "We can't have a boating service officer on every headland so we put our resources where they are needed, when they are needed."